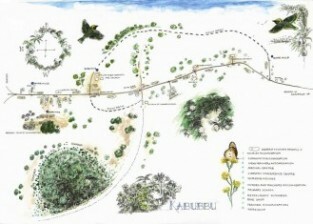 Kabubbu sits in lush, rolling countryside about 20 miles north of the Ugandan capital, Kampala. It has a population of around 4,200. It’s a 90-minute drive from the airport at Entebbe. The community comprises around 450 homes in an area of roughly four square miles radiating out from the village trading centre. Uganda has district, town and parish councils like the UK. Kabubbu parish is now part of Greater Kampala. The primary school, Health Centre and the library from where adult education is run are built on one site 600 yards from the village centre. The Trust High School and the foster home are close by. 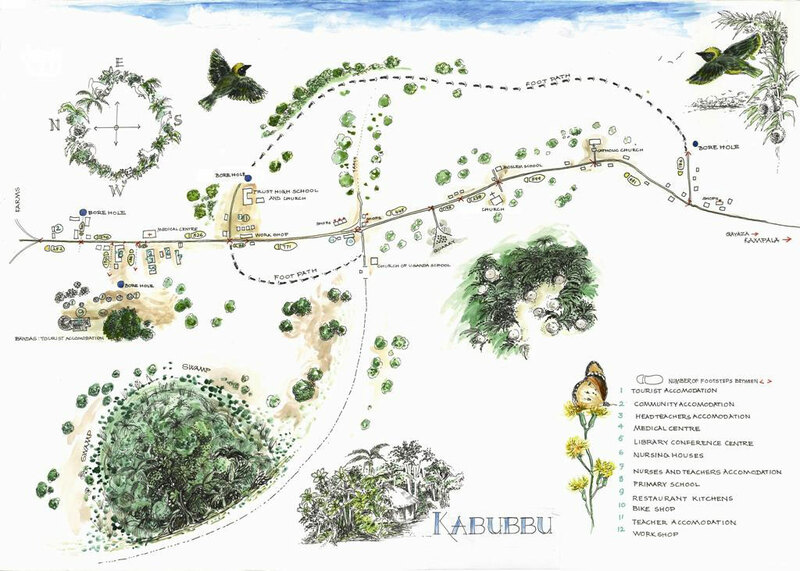 Kabubbu is about three miles down a dirt track from the main metalled road just beyond the town of Gayaza. The track is wide enough for cars, minibuses and lorries but can be difficult to negotiate in heavy rain. 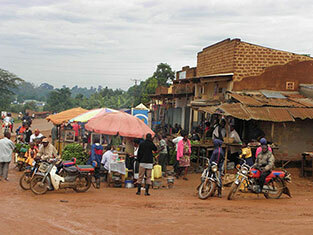 People get around on foot or by bike or on small motorbikes known as boda-bodas. (Watch: A trip around the village). The village centre has expanded since Quicken Trust first became involved in Kabubbu. In 2000 there was one shop. Now there are about 20. There’s even a tiny cinema and a local “radio station” transmitting by two loudspeakers to the community!! Households in Kabubbu are very different to the UK. There may be an extended family living together because young relatives have been orphaned. Several generations may share the same house. The father may be working elsewhere to raise money for his family. About 12% of villagers own the land on which they have built their homes. The rest are tenants. Traditional homes are made from bamboo and mud with thatched roofs. But these can disintegrate in heavy rain. Quicken has built more than 160 new homes – with locally-made bricks, cement-rendered walls and corrugated iron roofs. On average the students had meat to eat at home four times a year. Football was the most popular sport – with Manchester United, Arsenal and Chelsea the best-supported teams. The students watch games at the village ‘cinema’ – by satellite TV. For adults finding work is a challenge. Some work in the quarry near the trading centre; most work on the land; others produce bricks for building. There are two huge nurseries within a few miles which grow plants for export to Europe. At the turn of the 20th century – when Uganda was still a British protectorate, Winston Churchill described it as the “pearl of Africa”. Kabubbu prospered in the 1930s after medical missionaries set up a health clinic. By 1935 they had left. It’s not known why. The village sank into destitution – a decline mirrored later by the whole country. Uganda achieved full independence in 1962. But internal divisions led to tyranny under the regimes of Milton Obote and Idi Amin. Kabubbu was caught up in the fighting to dislodge Obote in 1984 when government forces occupied a hill in the village and spent two days shooting indiscriminately at local people. Two died. The 1980s saw the arrival of the scourge of AIDS. By 2000, 20% of Kabubbu’s population were children left orphaned by AIDS or other preventable and treatable tropical diseases. Uganda’s history is complex. The republic was formed by the bringing together of several kingdoms and tribes. The most powerful was Buganda – which still exists as part of the country. Kabubbu is within the kingdom of Buganda and it forms a central part of the village’s cultural identity. The people of Buganda are known as the Baganda people. They have a common tribal language – Lugandan – although English is the language of education. Uganda is predominantly a Christian country and Quicken Trust is based on a Christian foundation. But it welcomes children and some staff from other traditions. 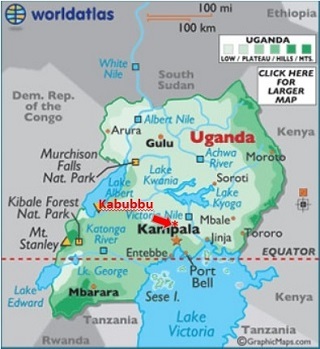 Kabubbu also has people from other parts of Uganda as well as migrants from abroad, mostly Rwanda. It prides itself on its Bugandan heritage and its tolerance and inclusiveness. Western visitors are always made welcome.